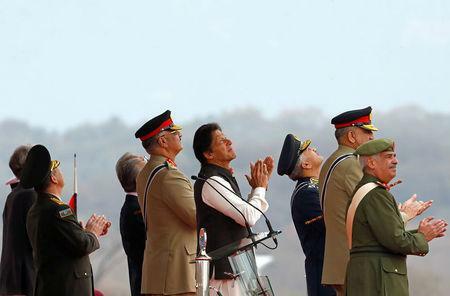 ISLAMABAD (Reuters) - Pakistan wants peace with India and they should focus on health and education, the Pakistani president said on Saturday during a parade to show off its military might following a tense standoff between the nuclear-armed neighbors. "We do not believe in war and want to solve problems through dialogue," President Arif Alvi said in his Pakistani Republic Day speech. "Instead of war we should focus on education and health." Saturday's military parade included an air show featuring the Pakistani-built JF-17 fighter jet. One of the aircraft shot down the Indian plane last month. "Today's parade is sending the message that we are a peaceful people but we will never be oblivious of our defense," Alvi said. "I welcome PM Modi's message to our people," Khan said. "I believe it's time to begin a comprehensive dialogue with India to address and resolve all issues.The dispute over the former princely state of Kashmir sparked the first two of three wars between India and Pakistan after independence in 1947. They fought the second in 1965, and a third, largely over what become Bangladesh, in 1971.